Last weekend, I was preparing for a 16-hour marathon of all eight live-action “Star Wars” films — which would start at 7 a.m. and go until 1:30 a.m. — when I was struck by a disturbing thought: The heroes in “Star Wars” are constantly celebrating, but their victories never last. 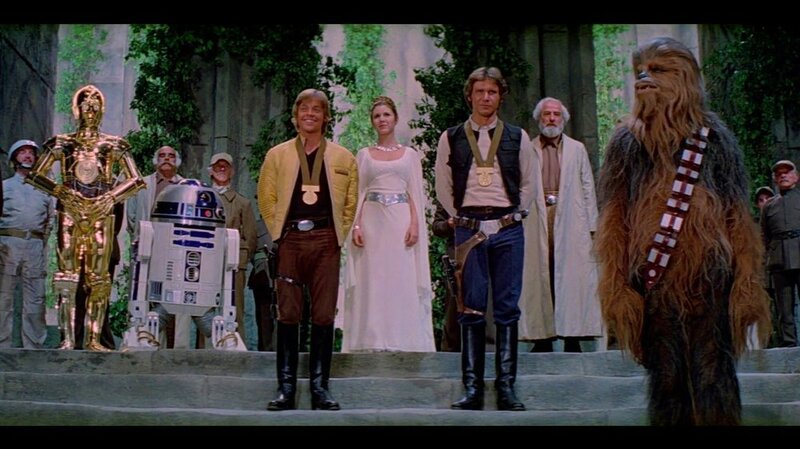 I thought of the time that the Rebel Alliance packed into a giant throne room and cheered as Princess Leia celebrated Luke, Han and Chewbacca for destroying the Death Star. John Williams’ triumphant score says it all (no really, Google that scene with the music removed — it’s hilarious and shows how much emotional heavy lifting that triumphant score was doing). It seemed that night that the villains had lost. But then, not only did the Empire’s forces not fall apart after the Death Star went down, they “Struck Back” in the next movie, and by the next one had even built a new Death Star all over again. Then, I thought of the time that the rebels blew up that Death Star, in a moment that saw the demise of both the Emperor himself and Darth Vader, too. Now it was really time to celebrate, and all across the forest moon of Endor (a place that may be in a galaxy far, far away, but that somehow always makes me homesick for Northern California) you could hear ewoks ceremoniously offering their “yub nubs” of joy loudly to the heavens. It seemed for sure that now, the Empire was gone for good. Well, they may have been, but then apparently came along something called the First Order, where the baby snake Kylo Ren cosplays as his grandfather Darth Vader and explodes with more rage than anyone in the galaxy has seen since the time a certain someone slaughtered a whole Jedi elementary school of younglings. I even thought of the time long before any of it, on Naboo, when the entire palace neighborhood took to the streets to joyously celebrate — um, what were they celebrating? I think it involved the defeat of a trade federation. Something to do with taxes?